This blog post on how to increase your milk supply is from 2014, how crazy is that?! I get so many questions about boosting your supply so I figured that I would update this and put it as a new post for 2018! A lot has changed since I last wrote this and I have also learned a lot along the way as well! I used to take fenugreek when I was nursing my first but it doesn’t ALWAYS boost your supply and it can also make a few babies fussier than usual. I have seen come across some better ways to increase your milk supply, should you need to! As always, feel free to add ways that have worked for you in the comments below! What I should have done when baby O was only taking one side, would have been to pump BOTH sides afterwards to completely drain them. If you do not do that, your telling your body that she only needs one side every few hours and your milk supply will drop like crazy (as mine did). She would have been fine with it, if she wasn’t growing – because she obviously needs much more now – then she did 2 months ago. I was also sick during this time with an upper respiratory infection, which makes you even more dehydrated. It is important to drink, drink, drink!! DRINK a crap ton of fluids. We are taking gallons. Like so much water that you think you might just burst at the seams 🙂 Even better than water, is gatorade. I drank a ton of it. Legendairy Milk Supplements // These all natural supplements have done wonders for my supply now that I am working out. I am talking the liquid gold but they have a few different options to choose from and it depends on your tolerance of certain ingredients, so just read all about them here! You can also use the coupon code: lynzy fo 15% off your order! Rest. Your body cannot make the milk your baby needs unless you are getting the rest that you need. My lactation consultant is adamant about this. Give the babe to the hubby/grandma/someone and GO TO BED girlfriend! Steel Cut Oats need to become your best friend. I had a bowl of this twice a day. I LOVE this stuff. I put organic maple syrup and berries on mine! One bottle of Guinness per day. Yes, beer. It’s yummy, it relaxes you, and it increases your boobie juice (or at least my LC told me that) 😉 I’ll take it! 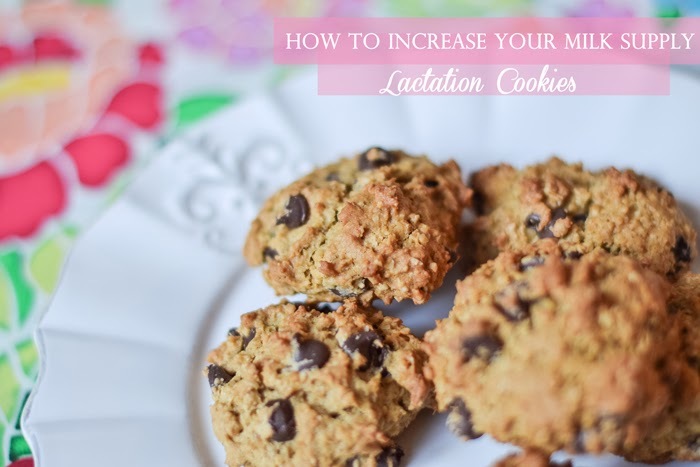 Lactation Cookies || The best damn cookies you’ll ever eat. Seriously, I love these and I ate like 4 a day. I swear they helped to increase my supply! 3. Cream the butter and brown sugar. Add eggs one at a time, beat well. 3. Stir in flaxseed meal mixture with vanilla to the butter mix. Beat until blended. 6. Scoop or drop onto baking sheet. The dough can be a bit crumbly, I used two spoons to scoop and transfer to the baking sheet. Oatmeal always helped bring mine back up! this post came at the perfect time and i feel like my supply is dropping!! definitely going to put these tips to use mama! i’m so glad you upped your supply! i can’t imagine losing mine (although my freezer is literally bursting with milk so i’d probably be okay for a while). such a disappointing thing, i’m sure. thanks for sharing! I don’t have an issue with my supply but would like to keep it high as my little lady gets bigger. Made an oder and plan on baking soon! Have you tried Motherlove More Milk Plus? It has Fenugreek, as well as other things. I still take it everyday and it doesn’t leave me with that maple syrup smell! Yes the Beer🤣🙌🏻🤷🏼‍♀️ Totes believe it helps! Except I’ll replace yours with Summer Shandy daily… I’m stocked up being as it’s seasonal lol! Just made these cookies, delicious. I baked them at 350, not 450 ( the first batch burnt because it was a bit high). Does it have to be the Brewer’s yeast? Is there a difference between that and regular active yeast? Question… the steel cut oats still feel tough after I bake them. Is this normal? I just made them and am having the same trouble. They are very tough. Just made these and my mixture was really wet. Ive re read the recipe several times and didn’t miss anything. anyone else have a similar outcome? Hey Lynzy, love your blog! Just wanted to share with anyone reading that I think the best way to know how much milk your baby is getting is by how many wet diapers they make per day. Other things like frequent night waking (becomes common at 4-months-old), feeling empty, and chugging a bottle are not reliable ways to guess if your milk level is too low. I just don’t want anyone to read this and worry unnecessarily. Of course, you can always talk to your pediatrician for professional, personalized advice. Do you have to use almond flour or can you use regular flour? Can’t wait to make these! have a couple of questions for you if you don’t mind. Is it simply me or does it look like some of the responses appear like they are left by brain dead people? What color GATORADE did you find to be most helfpul?